Continuous concrete curb edging adds dramatic style to your planting beds, creating beautiful definition to your residential or commercial landscape design. With an embedded galvanized steel cable and fiber mesh mixed in the concrete, it is a long-lasting product that will add beauty to your landscape for many years. CurbMaster is dedicated to serving your landscape edging needs by providing the highest quality concrete products available in the market today. We take pride in our work as well as each project we are a part of. Our knowledge and experience give you a professional crew that will have your project done on time and on budget. 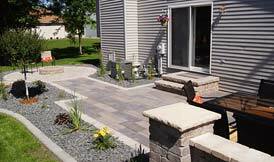 We thank you for visiting CurbMaster of Fargo/Moorhead. We look forward to working with you on your landscaping project.